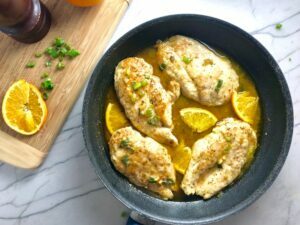 Ok, I know what you’re thinking…Orange Brown BUTTER Chicken!? And I say YES, damn straight! Butter Baby! It’s amazing 🙂 The butter is cooked down to this beautiful golden brown color and the flavor and aroma turns into this nutty deliciousness. 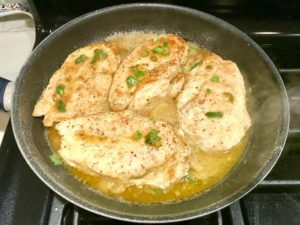 For this recipe, I promise you that I cut back on the amount of butter too, so it is not as scary as the title might sound! The fresh orange flavor is subtle and only slightly sweet, not overly orang-y. 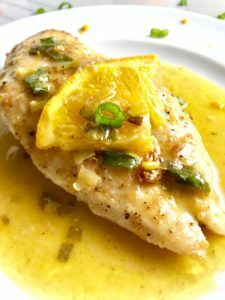 Overall, you get a silky, slightly sweet flavorful sauce that is unlike any other! This was another favorite dinner dish from my catering days. 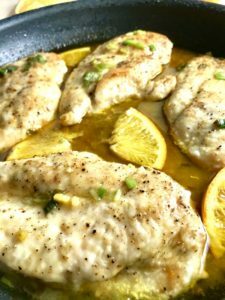 I loved serving this at reception events as a chicken option because it was a change from the typical Chicken Piccata. And guests always loved it asking me what was in it. But the ingredients are so SIMPLE it’s almost embarrassing. You need chicken breasts, a little flour, an orange, 4 Tbls butter, some chicken broth, and some scallions. Yep, that’s it! First, Add the 4 tablespoons of butter to a small sauce pot and simmer until it turns brown and starts to release a wonderful nutty aroma. Turn the heat off and let sit. 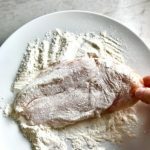 Next, dredge each chicken breast in flour seasoned with salt and pepper. Then place in a preheated pan coated with olive oil and sear on both sides. Add the chicken broth to the pan and scrape up all of the brown bits from the bottom of the pan. Add the scallions, the orange zest, the juice from the orange, and the brown butter. 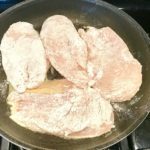 Turn the chicken over so that the flour on the outside thickens the sauce to perfection. Add the quartered orange slices for added flavor and garnish. 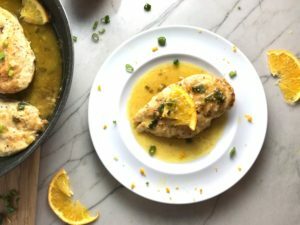 I like to serve this Orange Brown Butter Chicken with Rice so I can soak up all that delicious sauce and not miss a bit! 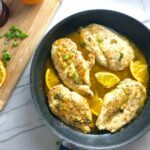 Ok, I know what you’re thinking…Orange Brown BUTTER Chicken!? And I say YES, damn straight! Butter Baby! It’s amazing The butter is cooked down to this beautiful golden brown color and the flavor and aroma turns into this nutty deliciousness. For this recipe, I promise you that I cut back on the amount of butter too, so it is not as scary is the title might sound! The fresh orange flavor is subtle and only slightly sweet, not overly orang-y. Overall, you get a silky, slightly sweet flavorful sauce that is unlike any other! 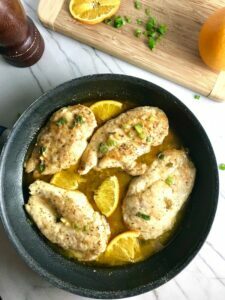 In a small sauce pan, add the butter and simmer on low heat until it gets brown and starts to release a nutty, almost sweet aroma, about 5-8 minutes. Turn off heat and set aside for later. Thinly Slice the 2 scallions. Cut the orange in half and cut 2 thin slices from half and then quarter those slices. Zest the other half of the orange, then juice both halves of the orange and set the juice, the zest, and slices aside. Preheat large skillet on high heat. Add flour to a large plate and season with salt and pepper to taste. 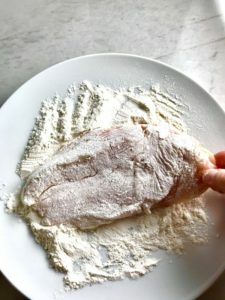 Dredge each piece of chicken in the flour. 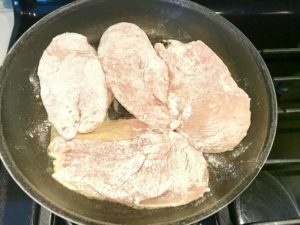 Add olive oil to pan and then add the chicken coated in flour to the hot pan. Cook on medium to high heat for 3-4 minutes, then flip each piece and cook for another 4-5 minutes. Add the juice from the orange, the zest, the butter, the scallions (leave some scallion for garnish) and the chicken broth. 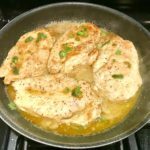 Cook for 1-2 minutes in the sauce and then flip the chicken and cook for another 1-2 minutes until sauce starts to thicken. Add salt and pepper to taste. Garnish with the orange slices and remaining scallions. < Previous Fish and Chips – Baked Crispy! The taste that butter gives to the recipe is indescribable!